Topics: Travel, Packages, Strip Hotels, Compare, Flights, and Car Rental. Its 2 nameservers are ns2.inmotionhosting.com, and ns.inmotionhosting.com. It is hosted by Corporate Colocation Inc. California, using Apache web server. 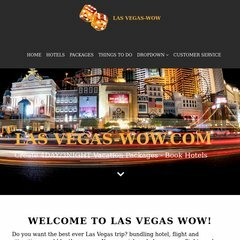 Lasvegas-wow.com's server IP number is 205.134.253.65. PING (205.134.253.65) 56(84) bytes of data.